Mayer Brown has a long track record of appellate victories—big and small—that advance our clients’ interests. But at Mayer Brown, appellate litigation isn’t just about winning cases. It’s about shaping the law. Through our work in the Supreme Court, our elite team of lawyers has transformed the legal environment. With a case that “turned the world of consumer class action law on its head” (Law360), we pioneered the use of arbitration to avoid inefficient consumer class actions (AT&T v. Concepcion). We charted the course that freed the securities markets from antitrust laws (Credit Suisse v. Billing). We convinced the Supreme Court to recognize constitutional limits on punitive damages (BMW v. Gore, Philip Morris v. Williams, and Honda v. Oberg). And in “the biggest securities-litigation court clash in a generation” (The Wall Street Journal), we snuffed out the theory of securities fraud “scheme liability” (Stoneridge v. Scientific-Atlanta). Our impact has been just as far-reaching in the federal and state appellate courts. Among our recent successes, one of our partners was hailed as “California’s class action killer” (The American Lawyer) after convincing the Ninth Circuit to recognize two important restrictions on class-action litigation (Mazza v. American Honda Motor). We won the invalidation of federal regulations prohibiting lobbyists from serving on federal advisory panels (Autor v. Pritzker, D.C. Circuit). We fended off an effort to impose a tort duty on businesses to make defibrillators available for customer use (Verdugo v. Target, Cal. Supreme Court) and an effort to impose on landowners a duty to prevent child trespassers from injuring themselves on known hazards (Choate v. Indiana Belt Railway, Ill. Supreme Court). And we won a critical procedural victory that paved the way for approval of an $8.5 billion settlement on claims involving mortgage-backed securities (BlackRock Financial Mgmt. v. Segregated Account of Ambac Assurance, Second Circuit). Mayer Brown innovated the practice of appellate law. We were the first global law firm with a team dedicated to pursuing big ideas in the highest courts. And we have maintained our edge by developing unmatched thought leadership in a practice that spans the country and the areas of law that matter most to the business community. Our appellate group practices at every level of the U.S. judicial system—at the Supreme Court (where Mayer Brown attorneys have argued 235 cases), in the intermediate appellate courts (where 25 different Mayer Brown attorneys have argued nearly a case each week for the past two years), and in the trial courts (where Mayer Brown’s appellate lawyers craft strategies and brief major issues). We focus. You can’t see the big picture if you’re looking at an issue for the first time. Our appellate practice is stocked with substantive practitioners who know their areas of law inside and out, from administrative to white-collar law. That know-how is what’s needed to have the strategic vision to chart the way forward. We roll up our sleeves. You can’t implement a sophisticated vision with a hands-off approach. Our stars don’t just make cameos. We own our cases and work with our clients from start to finish. We persevere. In the course of any difficult campaign, obstacles are inevitable. We see obstacles as opportunities to invoke our creativity and experience. We have achieved past successes by promoting developments in legal theory, drawing on social science research, and employing a strategic blend of law, public policy, and media. And we know when to take the long view—planning for future litigation by crafting favorable test cases, modifying business practices, or pursuing legislative changes. Mayer Brown is widely regarded as having the nation’s preeminent Supreme Court practice. Members of the firm’s Supreme Court & Appellate practice have presented more than 250 Supreme Court arguments—a breadth of experience that is unrivaled in the American legal profession. 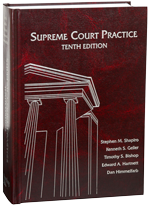 Indeed, of the five authors of the authoritative treatise on the High Court—Supreme Court Practice—three (Timothy Bishop, Kenneth Geller and Dan Himmelfarb) are current Mayer Brown partners. What may be less widely recognized than our current accomplishments is that Mayer Brown’s Supreme Court practice is almost as old as the firm itself. What follows is a brief history of that practice. View our Timeline.